On 25 and 26 February, Noterik participated in an Europeana Space workshop at RBB in Berlin. Together with Sound and Vision we were able to use our MultiScreen Toolkit to develop a small app to view a tour of the Berlin wall on a TV screen, with a smartphone serving as a remote control. 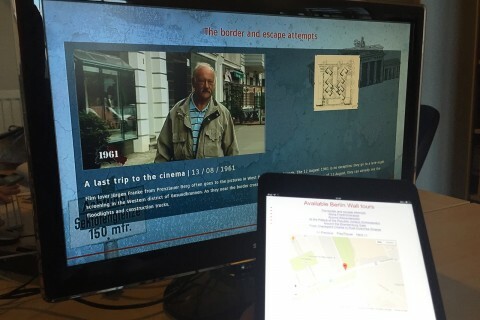 Viewers can click a link on their phone, that acts as a second screen, after which the Berlin wall tour is loaded on the main screen (watch demo with tablet and TV). Other participants were impressed at how we were able to use our open source toolkit to build a working multiscreen application in a relatively short time. For a comprehensive report on the workshop, check the Sound and Vision blog.